The sun is dead!! Mini iceage??? Are we approaching a mini iceage folks? history does have a habit of repeating itself.its definately bein colder of late.bring it on i say.here's some info on current state of our shining orb.all comments and thoughts welcome folks. 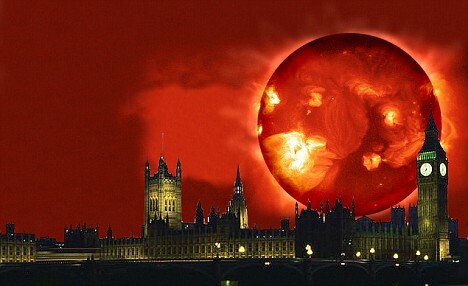 THE SUN IS DEAD,SHOULD WE WARN OF APPROACHING MINI ICEAGE? Although periods of inactivity are normal for the sun, this current period has gone on much longer than usual and scientists are starting to worry—at least a little bit. Recently 100 scientists from Europe, Asia, Latin America, Africa and North America gathered to discuss the issue at an international solar conference at Montana State University. Today's sun is as inactive as it was two years ago, and solar physicists don’t have a clue as to why. "It continues to be dead," said Saku Tsuneta with the National Astronomical Observatory of Japan, program manager for the Hinode solar mission, noting that it is at least a little bit worrisome for scientists. Dana Longcope, a solar physicist at MSU, said the sun usually operates on an 11-year cycle with maximum activity occurring in the middle of the cycle. The last cycle reached its peak in 2001 and is believed to be just ending now, Longcope said. The next cycle is just beginning and is expected to reach its peak sometime around 2012. But so far nothing is happening. Tsuneta said solar physicists aren't weather forecasters and they can't predict the future. They do have the ability to observe, however, and they have observed a longer-than-normal period of solar inactivity. In the past, they observed that the sun once went 50 years without producing sunspots. That period coincided with a little ice age on Earth that lasted from 1650 to 1700. Coincidence? Some scientists say it was, but many worry that it wasn’t. 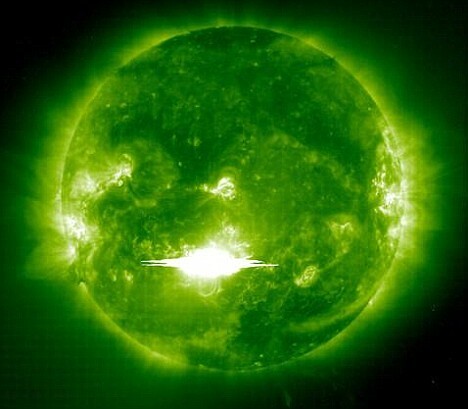 Geophysicist Phil Chapman, the first Australian to become an astronaut with NASA, said pictures from the US Solar and Heliospheric Observatory also show that there are currently no spots on the sun. He also noted that the world cooled quickly between January last year and January this year, by about 0.7C. "This is the fastest temperature change in the instrumental record, and it puts us back to where we were in 1930," Dr Chapman noted in The Australian recently. If the world does face another mini Ice Age, it could come without warning. Evidence for abrupt climate change is readily found in ice cores taken from Greenland and Antarctica. One of the best known examples of such an event is the Younger Dryas cooling, which occurred about 12,000 years ago, named after the arctic wildflower found in northern European sediments. This event began and ended rather abruptly, and for its entire 1000 year duration the North Atlantic region was about 5°C colder. Could something like this happen again? There’s no way to tell, and because the changes can happen all within one decade—we might not even see it coming. The Younger Dryas occurred at a time when orbital forcing should have continued to drive climate to the present warm state. The unexplained phenomenon has been the topic of much intense scientific debate, as well as other millennial scale events. Now this 11-year low in Sunspot activity has raised fears among a small but growing number of scientists that rather than getting warmer, the Earth could possibly be about to return to another cooling period. The idea is especially intriguing considering that most of the world is in preparation for global warming. Canadian scientist Kenneth Tapping of the National Research Council has also noted that solar activity has entered into an unusually inactive phase, but what that means—if anything—is still anyone’s guess. Another solar scientist, Oleg Sorokhtin, a fellow of the Russian Academy of Natural Sciences, however, is certain that it’s an indication of a coming cooling period. Sorokhtin believes that a lack of sunspots does indicate a coming cooling period based on certain past trends and early records. In fact, he calls manmade climate change "a drop in the bucket" compared to the fierce and abrupt cold that can potentially be brought on by inactive solar phases. There are no sunspots, very few solar flares - and our nearest star is the quietest it has been for a very long time. Last year, it was expected that it would have been hotting up after a quiet spell. But instead it hit a 50-year year low in solar wind pressure, a 55-year low in radio emissions, and a 100-year low in sunspot activity. "There's no sign of us coming out of it yet," she told BBC News. "At the moment, there are scientific papers coming out suggesting that we'll be going into a normal period of activity soon. "Others are suggesting we'll be going into another minimum period - this is a big scientific debate at the moment." In the mid-17th Century, a quiet spell - known as the Maunder Minimum - lasted 70 years, and led to a "mini ice-age". "I wish the Sun was coming to our aid but, unfortunately, the data shows that is not the case," he said. Prof Lockwood was one of the first researchers to show that the Sun's activity has been gradually decreasing since 1985, yet overall global temperatures have continued to rise. "If you look carefully at the observations, it's pretty clear that the underlying level of the Sun peaked at about 1985 and what we are seeing is a continuation of a downward trend (in solar activity) that's been going on for a couple of decades. "If the Sun's dimming were to have a cooling effect, we'd have seen it by now." Professor Lockwood believes that as well as the Sun's 11-year cycle, there is an underlying solar oscillation lasting hundreds of years. He suggests that 1985 marked the "grand maximum" in this long-term cycle and the Maunder Minimum marked its low point. "We are re-entering the middle ground after a period which has seen the Sun in its top 10% of activity," said Professor Lockwood. "We would expect it to be more than a hundred years before we get down to the levels of the Maunder Minimum." He added that the current slight dimming of the Sun is not going to reverse the rise in global temperatures caused by the burning of fossil fuels. "What we are seeing is consistent with a global temperature rise, not that the Sun is coming to our aid." "This is very exciting because as astronomers we've never seen anything like this before in our lifetimes," he said. "We have spacecraft up there to study the Sun in phenomenal detail. With these telescopes we can study this minimum of activity in a way that we could not have done so in the past." 2008 was a bear. There were no sunspots observed on 266 of the year's 366 days (73%). To find a year with more blank suns, you have to go all the way back to 1913, which had 311 spotless days: Prompted by these numbers, some observers suggested that the solar cycle had hit bottom in 2008. Quiet suns come along every 11 years or so. It's a natural part of the sunspot cycle, discovered by German astronomer Heinrich Schwabe in the mid-1800s. Sunspots are planet-sized islands of magnetism on the surface of the sun; they are sources of solar flares, coronal mass ejections and intense UV radiation. Plotting sunspot counts, Schwabe saw that peaks of solar activity were always followed by valleys of relative calm—a clockwork pattern that has held true for more than 200 years:. "What is Solar Minimum and Why Should We Care?" A 55-year low in solar radio emissions: After World War II, astronomers began keeping records of the sun's brightness at radio wavelengths. Records of 10.7 cm flux extend back all the way to the early 1950s. Radio telescopes are now recording the dimmest "radio sun" since 1955: Some researchers believe that the lessening of radio emissions is an indication of weakness in the sun's global magnetic field. No one is certain, however, because the source of these long-monitored radio emissions is not fully understood. Bristling with advanced sensors, "SDO" is slated to launch later this year--perfect timing to study the ongoing solar minimum. Modern technology cannot, however, predict what comes next. Competing models by dozens of top solar physicists disagree, sometimes sharply, on when this solar minimum will end and how big the next solar maximum will be. The great uncertainty stems from one simple fact: No one fully understands the underlying physics of the sunspot cycle. this breaks 25 consecutive days of no sunspots.here is the spotless days to date this year and last year. Out of 365 days in 2008, 266 were without sunspots. So far in 2009, January had 25 sunspot free days; February had 23 sun spot free days; and March had 28 sun spot free days. Solar Cycle 23 began in a May 1996 minimum, so by April 2009, it's been thirteen years between minimums and still no increasing sunspots. The last time a solar cycle has gone thirteen years between minimums was Solar Cycle 15 in 1902 to 1913. We appear to be heading for at least a minor solar downturn, perhaps not another Maunder minimum, but possibly something equivalent to the Dalton minimum which lasted from about 1797 to 1827 with only weak solar peaks around 1801-04, 1815-17 in that stretch. The current situation is about the same as around 1810, you could compare the two major peaks in 1778 and 1787 (a long duration peak) with 1979 and 1989, and then the moderate peak of 1801-04 with the recent 1999-2002 period. So we are in that situation with declining peaks of activity in our recent past, and a long extinction of the most recent peak followed by several years of very quiet solar behaviour as in 1809-11 (almost no sunspots then either). The Dalton minimum was also associated with a downturn in global temperatures but this is compromised by the 1815 eruption of Tamboro and the largest volcanic dust veil of recent historic times. If that had not come along in the middle of the Dalton minimum (albeit at one of the weak sunspot peaks) it is not so clear how much of a temperature signal would have been reported in the Dalton. There was another minimum that goes without a name from about 1875 to 1915, this was a more subdued downturn in solar activity but in general the weather was fairly cold in this period as well; once again, there was a major volcanic eruption (Krakatoa) at a weak solar maximum in this interval. Our current situation relative to that period would be similar to about 1877-78 although there was a major El Nino event in 1876-77 so the climate signals would have been different going into this analogue. The years 1879 to 1881brought notable cold to Europe although in North America the more obvious cold period was 1883 to 1888. I have to qualify all of my statements on climate with the observation that I see "global warming" as considerably over-hyped in the first place, so a slight downturn in temperatures in recent years means nothing much more to me than a sign of random variability raising its head. I don't see the current global climate as unusually cold, in fact over in the UK they are on course to record the second if not all-time warmest April in 350 years. Of course it was a colder than average winter in most of Europe and some parts of North America too. 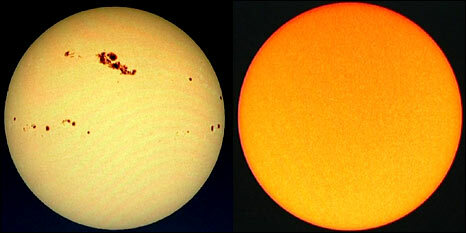 The other variable in this puzzle is that solar-terrestrial connections are not proven either, the Maunder minimum certainly fell in the coldest part of the Little Ice Age but that extended through many centuries of variable solar activity, granted much of it was lower than the active 20th century, but there are glaring counter-examples to the solar activity theory, for example, the winter of 1947 took place near a very active solar max, and the hot summer of 1911 was during a three-year interval of quiet sun conditions, while 2006 was also a declining rather quiet year. The main thing for me is that the global warming or climate change lobby have probably failed to prove their contention that runaway warming lies ahead unless we follow some extreme program of greenhouse gas reductions, what seems more likely to me is that natural variability has been driving the observed changes, and that scientists have been confusing their model output based on assumptions with locked-in real world changes that must necessarily occur (because their models predict them). This to me is the continuing fallacy often present in climatology through the decades, that the future climate will be a linear extension of the recent past climate. These trends often reverse and sometimes on very short notice. Beautiful image where you can clearly see that newly formed sunspot. Some scientists believe that an extreme cooling episode, potentially a mini-ice age, is imminent. Others think that it may already be under way. We know that when UV rays combine with oxygen to produce ozone, heat is generated. Fewer UV rays means less ozone—and thus less heat—is produced. When eruptive activity on the Sun decreases, solar winds weaken; fewer solar flares occur; and fewer geomagnetic storms reach Earth's atmosphere. A decrease in solar activity leads to an increase in cosmic rays reaching Earth's lower atmosphere. hey MTC,glad to read your thoughts and important relevant info on all this.i agree with you 100%,its not set in stone by any means on what actually triggered past severe cold spells.perhaps all we need now is a serious eruption to take place during this quiet solar spell.plumes of ash to start the chain reaction or perhaps its all cods wallop.however all past experiences can't be overlooked. Last edited by Redsunset; 23-04-2009 at 16:50. Say yes to global warming! Global Warming has gone on strike. Here's some more info for those not fully understanding what we mean when we talk of the Maunder Minimum. The Maunder minimum is the name given to a period of extreme solar inactivity that occurred between 1645 and 1710. Of particular interest is that this period of inactivity corresponds closely to one of the coldest periods of the so-called "Little Ice Age" in Europe, a time of long, cold winters that caused severe hardships in the pre-industrial revolution world. This has led scientists to extensively study the possible influences of solar activity on terrestrial climate, as well as examine other stars for evidence of activity cycle behavior similar to the Sun's. Some of the first telescopic observations were made by Galileo in 1611, and he immediately noted the presence of dark blemishes on the Sun's surface; these were the now well-known sunspots. (Several of Galileo's contemporaries saw sunspots as well, but Galileo is the most famous and usually gets the credit for "discovering" sunspots.) Today we know that the number of sunspots rises and falls in a roughly 11-year cycle; this is one of the most obvious manifestations of the solar activity cycle. Although sunspots were observed telescopically in 1611, it was not until 1843 that an amateur German astronomer, Heinrich Schwabe, noticed a periodic rise and fall in their numbers. That it took over 200 years for astronomers to notice something so seemingly obvious is some cause for wonder, but it may be partly explained by the nearly complete absence of sunspots for 70 of those years, between 1645 and 1715. For reasons not yet understood, the solar cycle operated at a greatly reduced amplitude during that time. Evidence suggests it did not cease entirely, but the sunspot number—an index representing the total level of sunspot activity at a given time—during the late 1600s was reduced by a factor of 10-20 from its typical value during "normal" cycles. This perplexing aspect of the sunspot record was formally pointed out by the astronomers F. W. G. Sporer and E. H. Maunder in 1890, and it is now known as the Maunder minimum. The existence of the Maunder minimum is interesting on purely astrophysical grounds, because it suggests that the regular rise and fall of sunspots observed from 1715 all the way through to the present day may not be a permanent, or even typical, aspect of solar behavior. It is possible to create a rough reconstruction of the sunspot record prior to the invention of the telescope, using indirect indicators of solar activity, and there is evidence for other Maunder minimum-like periods intermittently from about A.D. 1250 through 1715. The solar cycle as observed today, is therefore not the state in which the Sun spends all—or even most—of its time. Having only observed one Maunder minimum, we have no idea whether the Sun spends 10%, 50%, or 90% of its time in such a state. Even the "normal" 11-year cycle seems to have longer-term behavior. Different cycles have different strengths, with some of them showing more sunspot activity than others. The strengths of the cycle peaks seem to follow a roughly 80-year period of very strong cycles, slightly weaker ones, then back to stronger ones, and so forth. With detailed sunspot records extending only a few hundred years, it is difficult to confirm or disprove this hypothesis. Combined with evidence for multiple periods of nearly complete inactivity, it becomes impossible to say whether the solar activity cycle, so extensively studied in the last 30 years, is normality or an aberration. The seemingly erratic behavior of the solar cycle has led a number of astronomers to spend the better parts of their careers studying activity cycles on other stars, the idea being that if those stars show activity cycles or Maunder minimum-like characteristics, we might be better able to understand our own star. Most of this pioneering work has been carried out at the Mt. Wilson Observatory, near Los Angeles. Observations of solar-like stars have been underway at Mt. Wilson since 1963, and the program has accumulated a vast database of solar activity data. The result has been the discovery of a veritable zoo of activity cycles. Some stars have well-behaved cycles with periods comparable to our own Sun's 11-year cycle; these are of particular interest for comparison to the Sun. Other stars have highly variable cycles, while still others vary wildly but with no discernible, regular period. Finally, there are stars that show a complete absence of any activity cycle. Some of them appear to show no cyclic activity at all, while others exhibit tantalizing evidence of having "turned off" midway through the 30 years they have been observed from Earth. Whether or not these stars are truly in a Maunder minimum phase has not been answered, because it is very difficult to tell if they have low-amplitude cycles or no cycles at all, and it is even more difficult to study their finer characteristics in detail. However, there is no doubt that pronounced, fairly regular activity cycles like the Sun's are not universal either for the Sun or its stellar cousins. Examinations of the solar activity cycle and the unusually cold weather of the Maunder minimum period have spurred significant controversy among astronomers, atmospheric scientists, and climatologists. The period from about 1300-1715 is known as the "Little Ice Age" in Europe, a period characterized by unusually long and cold winters. This period coincides closely with the time during which the Sun is known to have had time of inactivity, with some of the worst weather occurring squarely during the Maunder minimum. In 1991, a pair of Danish meteorologists published a paper in which they pointed out a remarkably strong correlation between the length of the solar activity cycle and the global mean temperature in the northern hemisphere. Not all activity cycles are the same length, with longer cycles (12-14 years) seeming to indicate cooler global temperatures than the short (9-10 year) cycles. It is very difficult to assess the effect of even recent solar cycles on global climate, let alone those from the Maunder minimum period, because of the relatively short time span for which detailed observations exist, and because climate records become sparse to nonexistent as one looks back more than a century or so. Despite the ongoing controversy, for which there is decidedly no definitive answer as of the year 2000, there is no doubt the Maunder minimum years were a time of significant misery in Europe, with the long, harsh winters leading to shortened growing seasons, failed crops, and widespread famine. Whether, or to what degree, the Sun is responsible for this, is an important question for atmospheric scientists and astronomers to tackle over the next few decades. 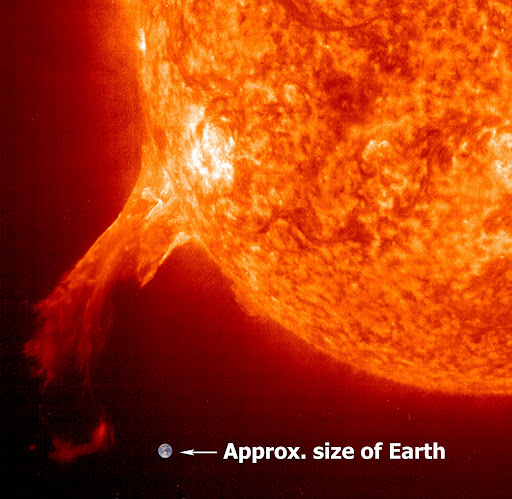 just for fun,heres a solar flare with the earth next to it.anyone for toast. There are some solar activity records from before the telescope age, that are reconstructed mainly from auroral sightings through the centuries. Schove published these about forty years ago and they are available in the appendix to Hubert Lamb's two-volume work, "Climate, Past, Present and Future." I have a copy and it shows basically the following trends since about 290 AD (there are some scattered reports from earlier times but a more continuous record begins with a peak in 290 AD). Most of the 3rd and 4th centuries were active, comparable to the 18th century. From about 500 to 900 the Sun was somewhat less active according to these records, but the downturns were not any weaker than the Dalton, and there were some intervals of fairly intense activity. The 10th century was a period of strong activity, and this seemed to fade slowly through the 11th century. The period from about the 12th to the 14th century was active and some of the peaks in the late 14th century were estimated to be among the strongest ever recorded. Then the 15th century had a much weaker period, which is now known as the Sporer minimum. This century was just about as weak as the Maunder. The Sun then rebooted its cycles and became moderately active in the 16th and the first half of the 17th century. Galileo got to see some fairly regular sunspot cycles before he died (whenever that was) and there was a cycle that peaked in 1649 before the Maunder minimum set in. Longer records can be estimated on a more general basis from indirect records in pollen sediments (slight differences in radiation etc) and in general terms it is believed that the Sun basically has two modalities, one that is active and regular with 10-year cycles, and one that is less active and irregular with 12-15 year cycles. These seem to occupy roughly 75 and 25 per cent of the time, respectively. So the chances are fairly good that one of these weaker periods lies ahead, but weaker periods seem to come in all shapes and sizes; the average of their duration is about 30-40 years, and the longest they seem to last is about 70-80 years. However, the Sun can remain active without significant breakdowns of the cycles for up to 200 years. During these longer intervals of regular activity, there is a tendency for the peaks to increase towards a grand finale, then one or two moderate peaks towards the weak modality that follows. However, this is not always the case. I suspect some complex external cause because it is rather scary to think that our "stable" Sun is capable of such variations in activity just from internal processes alone. It makes you wonder what its range might actually be over ten thousand or a million years if what we've seen since 1500 is any indication. Now, in case anyone wonders, the correlation of auroral activity and sunspots is fairly high and so that method of estimation is probably fairly reliable. However, the auroral peak in each cycle often comes a little later than the sunspot cycle. So if you look at Schove's dates, you are probably looking at years that average 2-3 years later than the sunspot cycles. Am I missing something? There's an enormous star 8 minutes light travel away. Its thermonuclear energy is furiously blazing away to keep us alive and toasty for the next few billion years, and people are saying it's dead? ah come on now confab,its the scientist way of discribing the sun going through its extended solar minimum cycle.should have picked up by now.thats why there's all this talk of previous historic events like the dalton and maunder minimum. The UV emission of the Sun has not changed at all, which is interesting as the other parameters have changed a lot (being "dimmer", solar wind less magnetic field strength and less ram pressure because of lower density). The ratio of He of H has not changed. Basically, the feeling is that we are in a very very interesting time of solar physics. Everything is being measured, and this is the first time in the space age that we have an anomalous minimum and that we are leaving a GSM. Alot to take in but interesting if our sun does decide to stay in a slumber.we really don't know whats gonna happen but personally i'd welcome a return to great snowstorms of yesteryear. When Did Solar Cycle 23 Go Wrong? A. Broomhall (University of Birmingham), W.J. Chaplin, Y. Elsworth, S.T. activity proxies. We also observe a quasi-biennial signal in the p-mode frequencies. Principle Component Analysis methodology and the principle eigenvalues are to be reported. numbers in the current cycle will be discussed. the variations of both prior to the space age are discussed. explain the weakening of the heliospheric magnetic field. through the solar cycle polarity reversal of the heliospheric magnetic field. and built and operated by the Space Research Centre in Wroclaw, Poland (PI Prof.
will be given and compared with those made during previous solar minima. A. Wolfendale (Durham), A.D.Erlykin and T Sloan. irradiance. However, even here there are problems. Last edited by Redsunset; 23-04-2009 at 00:47. And now to really throw a spanner in the works,here's an article from the mail online,gas how it then concludes that its due but may not happen.im now hoping too that this quiet period we're experiencing isn't the calm before the storm. But down on the surface, cocooned under an ocean of air, we rarely notice more than the pretty lights in the sky, created as the electrically charged particles from the Sun sweep into the Earth's own magnetic field to generate the Northern and Southern Lights. That day, one of Britain's top astronomers, Richard Carrington, was observing the Sun. 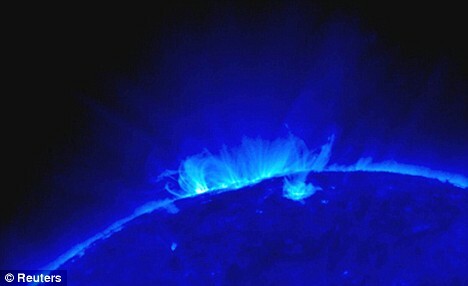 A bright flash of light erupted from the Sun's surface and detached itself from it. Brilliant aurorae lit the Earth's night skies right down to the Tropics - their light being so brilliant it was possible to read a newspaper at midnight. In California, a group of gold miners were roused from their bed hours early, thinking the dawn and a new day's prospecting had come. It was 2am. But it does now. Electric power is modern society's 'cornerstone technology', the technology on which virtually all other infrastructures and services depend. 'Every year, our human technology becomes more vulnerable,' he says. We also know that the Sun's activity waxes and wanes in 11-year cycles. Currently, the Sun is very quiet. But a solar maximum - a peak of activity - is predicted for 2012, and this is when a superstorm could strike, probably around either the spring or autumn equinox, when the orientation of the Earth's magnetic field to the Sun makes us very vulnerable.